Theses: To Share or Not Share? Over the past few years, I’ve thought several times about making my undergraduate and master’s theses available online – both papers are available for in-library use at the respective institutions I completed my degrees at, but were initially deposited in years when the standard format was paper (or paper and a CD-ROM). In 2009, I finished a BA in History at Purchase College, State University of New York, where one of the graduation requirements is to complete a “senior project.” Like many students, my senior project took the form of a thesis – a personal research project aimed at synthesizing the knowledge I’d gathered throughout my undergraduate degree and contributing something new. Honestly, I loved the experience and I definitely think senior or capstone projects should be required for undergraduate students at more institutions – it was a great learning experience that meant that I had a decent writing sample to show others if needed, and it made the concept of writing a thesis for my master’s degree much, much easier, because I knew I could conceive my own project and complete it. Don’t get me wrong – it was stressful and I definitely pulled too many all-nighters, but when I finished I felt amazing. 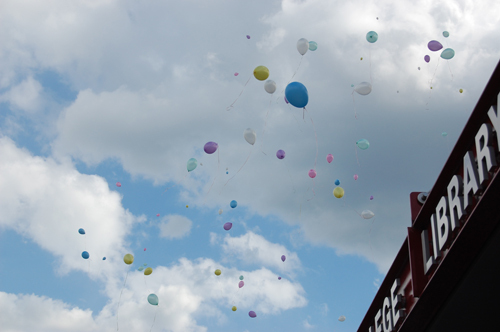 SUNY Purchase also has a wonderful tradition around submitting senior projects – back in my day1, all graduating seniors lined up in front of the academic building associated with their major, and the faculty and seniors walked over to the library together. Each student took their turn walking up the library stairs and plunking their large sheaf of paper (and occasionally a CD-ROM) in a box while everyone cheered. Then we all went across campus to the annual Senior BeerBQ, one of the only events held by the college that was allowed to serve alcohol, and faculty members served up burgers and DJ’d from playlists on their iPods.2 I keep on telling institutional repository folks that the best way to get submission rates up is to have a big celebratory parade and party for people who submit, because this was SUCH a fun experience! 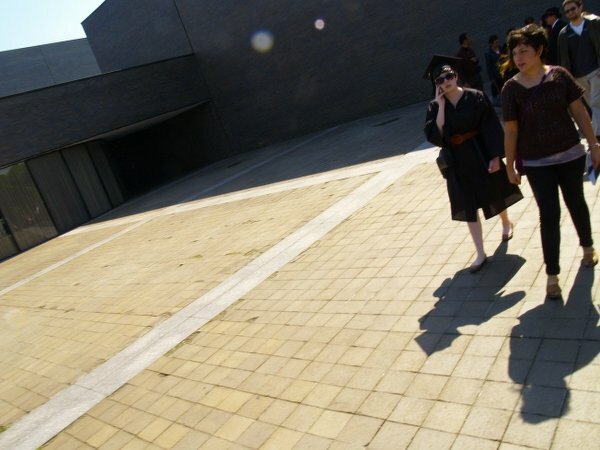 I’m literally talking on a BlackBerry in this picture, and YES, I did cinch my graduation robe with a belt from H&M. Photo by Sam Branman. Student senior projects can be found through this LibGuide at the Purchase College Library – because mine was submitted in 2009, it falls into the “collection housed in Library (no electronic access)” category. My thesis, “The New Jersey Turnpike: A Road Trip Through the History and Culture of New Jersey,” explored the idea of the rest stops along the New Jersey Turnpike serving as public educational spaces. I was curious how and why the rest stops got named after historical figures to begin with, and trying to find answers to that led to my first experiences doing archival research (and first experience being shut down by a PR rep when you’re asking too many questions!). Local catalog description of my undergraduate thesis. Four years later, in 2013, I finished up a dual master’s degree program at Simmons College (now Simmons University). For the MA in History half of the degree, we were required to complete a thesis. In practice, most people in the dual degree program tried to tie their history thesis into archival and/or library practice in some way. My thesis, “Going Down in History: The Collective Memory of the Titanic” was born out of a eureka moment while prepping for the World Civ II survey class I TA’d for – I was reading Edmund Burke’s 1790 “Reflections on the Revolution in France,” and I had just gotten to the section on whether all occupations were honorable. Screenshot of page 49 of Burke’s pamphlet, from Google Books. 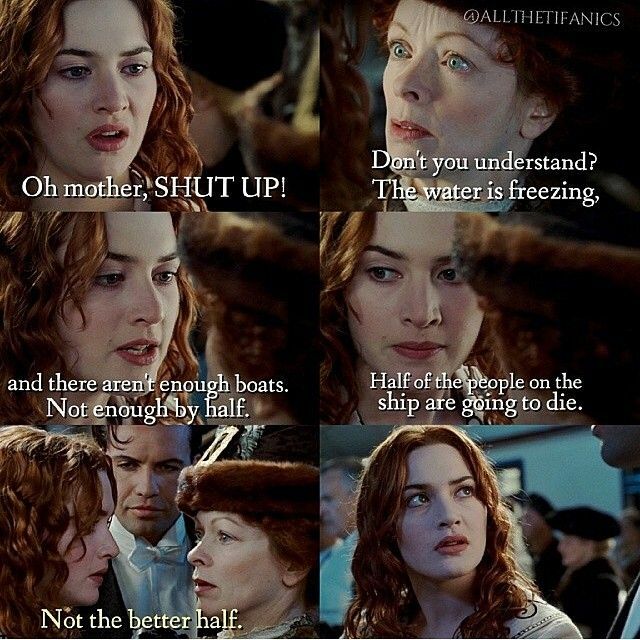 Screenshot from Titanic by @allthetifanics. Cal’s “Not the better half” is what came to mind when I read Burke’s words, and suddenly I had an epiphany: everything can be connected to the Titanic! That’s an exaggeration, but I was curious: how come the sinking of the Titanic has such a seemingly strong presence in collective memory, when plenty of other historical events that may have had bigger impacts aren’t so present in popular culture? That question led me down a path that included research trips to London, Southampton, Belfast, Cork, Cobh, and Halifax, viewing dozens of movies, and reading widely on the presence of the Titanic in pop culture, the formation of social, collective memories, and what remembering and forgetting means. 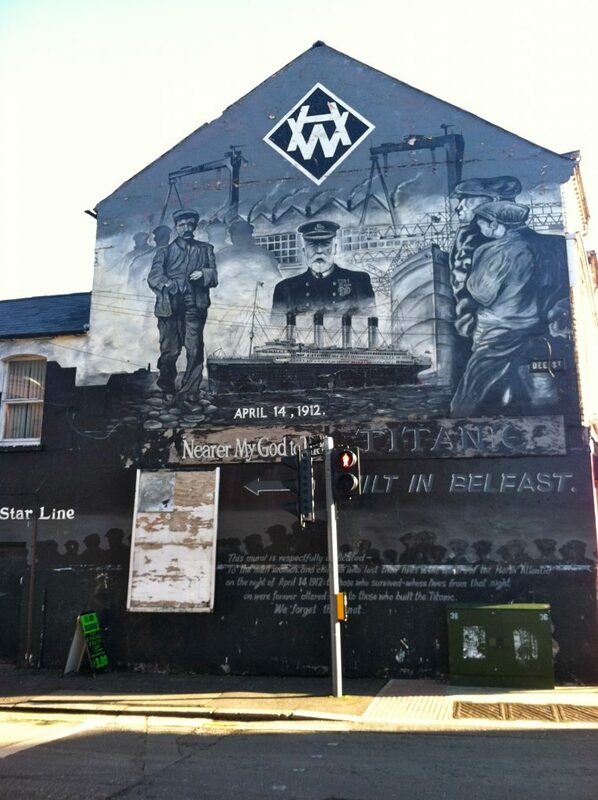 Have you ever wondered if there are murals about the Titanic in Belfast? Well, there are! This one is (or was, in 2013) off of Newtonards Road in Protestant East Belfast, in an area known for its sectarian wall murals. I’m actually enormously proud of my master’s thesis, and not just because I won a school award for it. I intended to study the intersection of history, collective memory, and pop culture by using the sinking of the Titanic as a case study, and to examine how collective memory of the sinking of the Titanic has moved away from the event itself to remembrance of an increasingly totemized symbol, and I feel like I accomplished that – it’s the deepest I’ve delved into any topic still. Like my undergraduate thesis, my master’s thesis is available in the school library – this case, Simmons University’s, as you can see in the screenshot from their catalog below. Catalog record for my master’s thesis. All of this nostalgia for my academic journey is to say: neither my master’s or bachelor’s thesis is available digitally, and both are in-library use only at my respective alma mater’s. I did a search in WorldCat, and only my master’s thesis shows up out of the two. Neither thesis is particularly easy to find information about, never mind actually read. So, maybe it’s time I MADE them available online? And really, why haven’t I already done that? 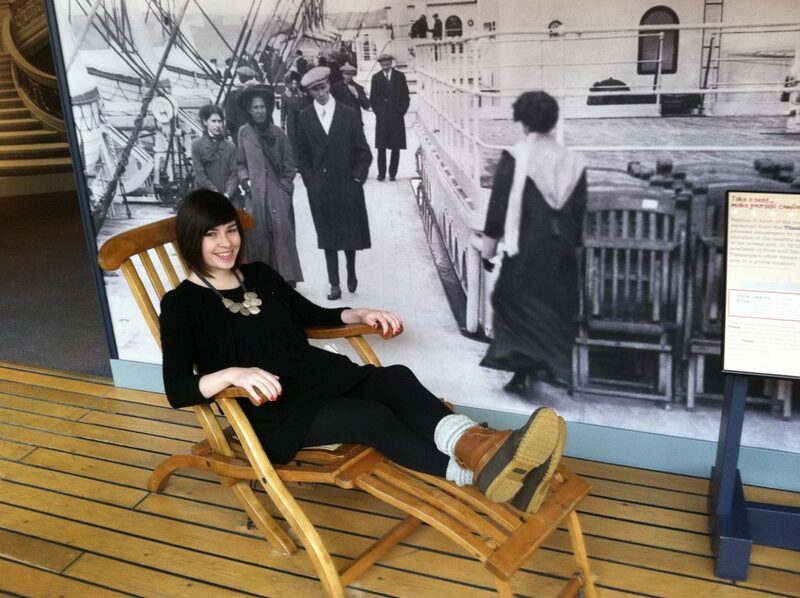 Sitting in a replica Titanic deck chair, during a 2013 research trip to Halifax’s Maritime Museum of the Atlantic. Photo by my mom, Catherine Christian. Six years later, it feels overdue – in effect I did embargo my undergraduate and master’s thesis, because they are very hard to gain access to in person and impossible to access digitally. And my mindset has changed quite a bit too – I’m less scared of being judged solely on my earlier work, and more comfortable with publicly sharing things that might be kind of, sort of still works-in-progress. I do still hope to publish something based on my master’s thesis research – particularly around the concepts of regional collective memory vs. transnational memory (chapter 4!). When I look at my undergraduate thesis, I mainly see the errors – thoughtless typos, how the argument was a bit shallow, how I would do it differently now. That undergraduate thesis was a gigantic accomplishment when I finished it, not because it’s particularly amazing, but because it’s what led to my getting a Bachelor’s degree – something I wasn’t really sure I was going to accomplish, something that no one else in my nuclear family had. I wasn’t sure if I wanted it readily available digitally because I know I can do better than that. My master’s thesis is a bit of a different story – there are undoubtedly errors and inelegant turns of phrase in there too, but I was more concerned about widely sharing the content of that thesis for the reasons that the AHA and some historians cited in 2013: if I wanted to return to these ideas, shouldn’t I sit on the early version of them until I can publish, so I can get proper (read: tenure portfolio) credit for it, and so that another researcher doesn’t build off of my ideas before I can even get them really out there? Both sets of concerns are real ones, and I don’t mean to minimize them when others have them about their own work. But, for me… I think it’s more important to share the research process and products as freely as I can. It’s more in line with the type of scholar I want to be. If people (read: future employers) think that my senior year undergraduate writing is as good as I can do, I invite them to read other, more recent pieces I’ve written.4 If others want to build on the ideas I brought up in my master’s thesis before I get a chance to expand on them myself, please go ahead! Our ways of thinking won’t be same, because we will be approaching those ideas and topics as different individuals. I’m not going to be scared that sharing my work will hurt me or my career prospects, because frankly… I don’t believe it will. Christian-Lamb, Caitlin. “The New Jersey Turnpike: A Road Trip Through the History and Culture of New Jersey.” BA thesis, Purchase College, State University of New York, 2009. Christian-Lamb, Caitlin. 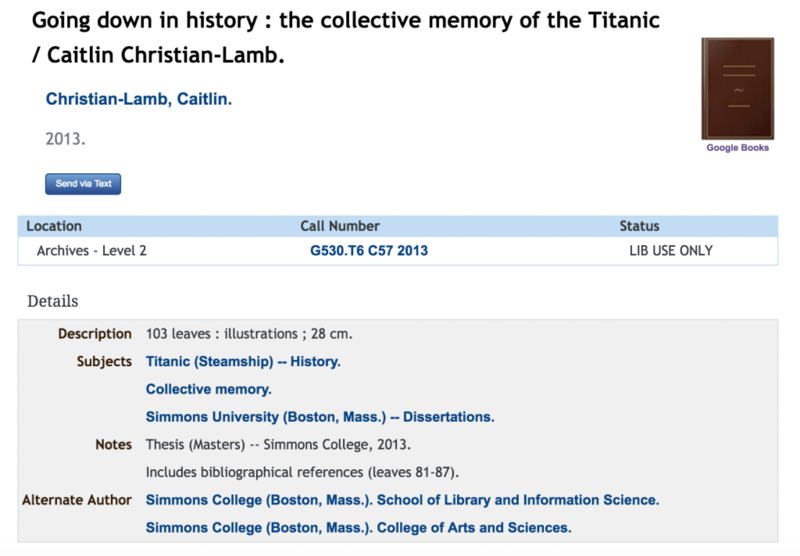 “Going Down in History: The Collective Memory of the Titanic.” Master’s thesis, Simmons College (now Simmons University), 2013. I’m an elder millennial! We didn’t have wifi in the dorms – we used ETHERNET! Get off my lawn etc. The mid to late 2000s were a wonderful time and I won’t hear a word against being a youth then, good day. I say six years later, like I’m somehow infinitely wiser and more experienced. For instance, that master’s thesis! Previous Post Eating & Drinking in Woodley Park (and Beyond) during SAA 2018!